Taking your car downtown for your visit to The Hideout? You’re in luck! We have partnered with Lanier Parking to offer discounted parking in the evenings for all of our patrons and students. 1) Pre-pay for parking using this link. Simply enter the date and time of your visit to The Hideout, enter your payment information, and complete your order. You should receive a code to use to get out of the garage when you park. 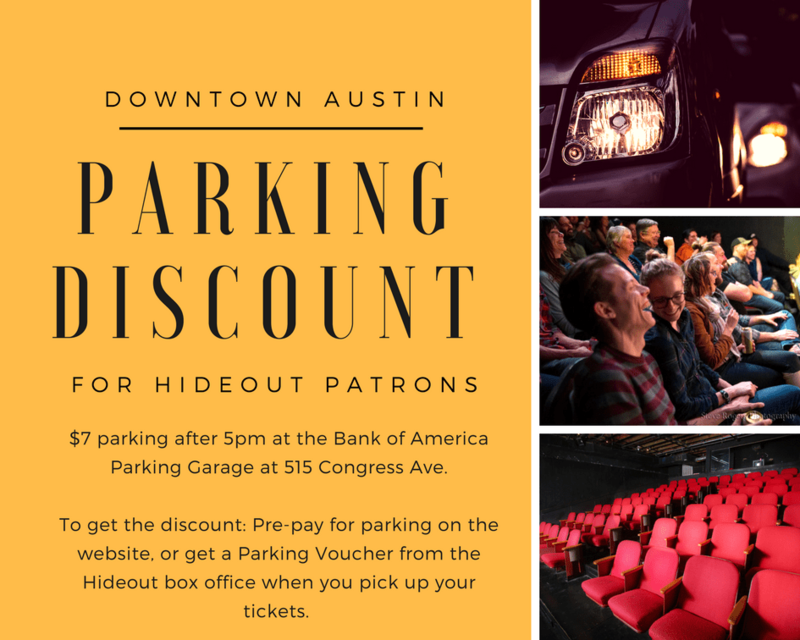 2) Ask for a Parking Garage Voucher at the box office when you collect your tickets the night of the show. The QR code on the voucher will get you the discounted $7 rate when you leave the garage at the end of your night. That’s it! Hopefully that will make getting downtown to see The Hideout’s shows that much more effortless and fun! Please direct all billing questions to SpotHero (for pre-paid parking) and Lanier (for payments at the garage) directly. The Hideout doesn’t have the ability to issue parking refunds or adjust reservations.